Hello, everyone here at MTG Cardsmith. I have decided to come back into the contest making scene by bringing you a contest with a subject that means a whole lot to me. Family Matters... or for short FAMILY. Now I'm not trying to have a pity party here but her is my reasoning behind doing this contest. Family means a lot to me. I have very little of my family left that sees me on any type of basis. I say this because my Mother and Father have both passed away 4 and 8 years respectively. I was technically an only child. One thing I didn't know until later in life was the fact that I had an older sister. She was born 3 years before me and was a Pre-mi and she died by SIDS. Her name was Katyhrine (Ka-thir-in) and I keep her in memory to this day by honoring her by naming my heart after her. The family I do get to see lives 60 miles away from me and I only see them at best once a month and I cherish that moment because it may be the last time I ever will get to see them. I HOPE now you can see why I chose this subject as my first contest after about 4 months of not doing one. Now onto the contest, this contest is simple yet at the same time CHALLENGING. I would like you the Cardsmith to find a Legendary creature that has no family and give it a family member. But to show you what I want in a card here are some examples I made. 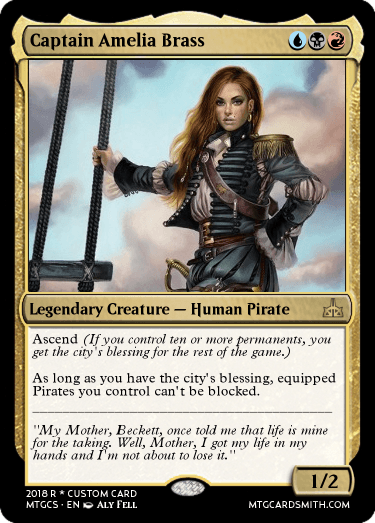 This is My card talking about her "Mother" Admiral Beckett Brass. and these cards are Fumiko the Lowblood talking about her "New Son" Burain, Blind to Fate. #3 When you post your card, in some fashion post either a link to the real card or post the real card with it like I did. #4 The number of entries one can submit is UNLIMITED. #5 The card must be flavorful in both the text box and the flavor text. #6 HAVE FUN DOING IT! Second Place gets 4 Favorites of your choice and a Follow. Third Place gets 3 Favorites and a Follow. Each of the chosen winners MUST choose an Honorable Mention. 4th through 6th place shall get their card Favorited and one choice of their own. every other submission will be favorited. GOOD LUCK TO ALL AND HAVE FUN. Thank you for enjoying this competition. Danke, dass Sie diesen Wettbewerb genießen. I'll have to refresh myself on MTG lore before I can enter. But I hope to enter soon! Ahhhh, I REALLY wanted to do Gisa and Geralf, but they do technically have a ma and pa. And Mikaeus is related to them. Darn. But! Ludevic exist so ye, close enough, hehe. 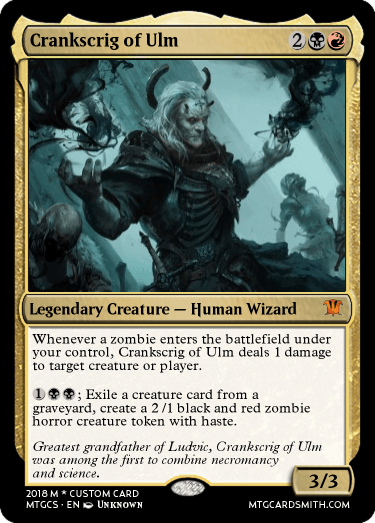 Ludevic of Innistrad everyone, and his grear great insert some greats here grandpa! This is an old card remade with the new border! This character may well trample all over the canon, but I'm pretty pleased with the idea, so I'm going to roll with it. This is Mika Beleren. Remember him? No? Yeah, no-one else does either. Maybe that's just how he likes it. I'd tell you more about his backstory, but I've forgotten it... Perhaps Jace isn't the only one with mind altering abilities. Can you make a card for a character that has family members but there are no cards for those family members? Like the grandchildren of Yasova Dragonclaw from the core 2019 story? Yasova Dragonclaw is a card herself, so technically you're still making her family. 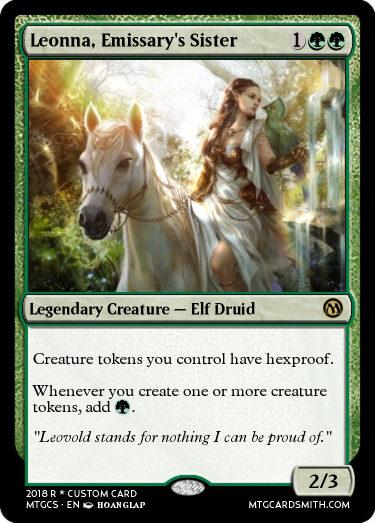 @sorinjace it's also reference to Saffi Eriksdotter, Lhurgoyf, Tarmagoyf, and really every "Lhurgoyf" creature. There are no legendary "goyfs" so it isn't technically a valid entry. @Faiths_Guide I think that's up to @Dechujoh64. The rules section just states that "You MUST mention in some way the real MTG card in the FLAVOR TEXT." 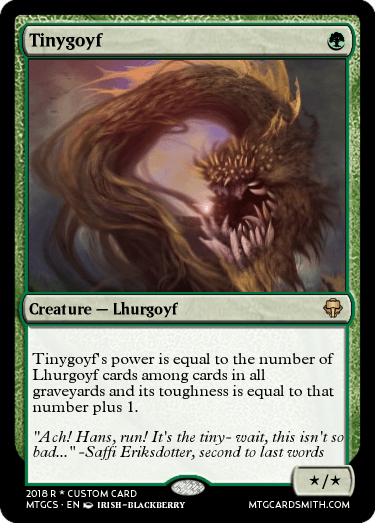 And come on, it's baby Tarmogoyf! What's not to love (well, besides from the fact it's a mold monster.... but that's beside the point.) Tarmogoyf doesn't have a family. All the other Lhurgoyf's make fun of him for being so weird. And ever since Fatal push was printed, all of his Jund buddies have been telling him he's past his prime. This kid was all Tarmogoyf had left! 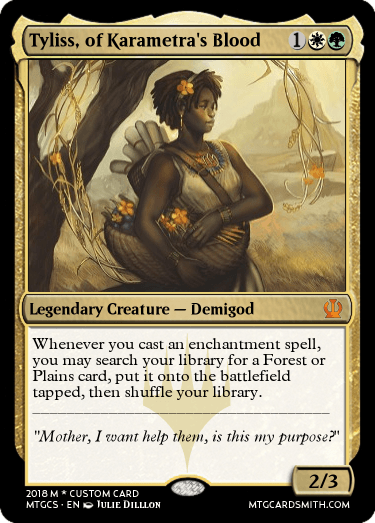 "I would like you the Cardsmith to find a Legendary creature that has no family and give it a family member." But yes, @Dechujoh64 can make whatever decision they'd like on its validity. I just didn't want you unknowingly disqualified on a technicality! I don't believe there was any relatives/family for him, but if there was, well, crud. I've made Leovold's sister (through arduous randomizing I chose Leovold). Now I want there to be a Z.